Whether it's a replica of your town's trolley or you want a charming addition to your village, the Main Street Trolley Line is the answer. Interior accessories can be as simple as bench seating, a steering wheel and an operable train whistle or as action-packed as a slide out the back of the trolley. 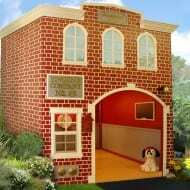 No matter what you choose, the children will enjoy the fun and imagination of this adorable addition.